O-101 R2 below, O-101a R3 at bottom. Somewhat available in all grades up to MS66, but high in demand as an overdate and a Redbook variety. 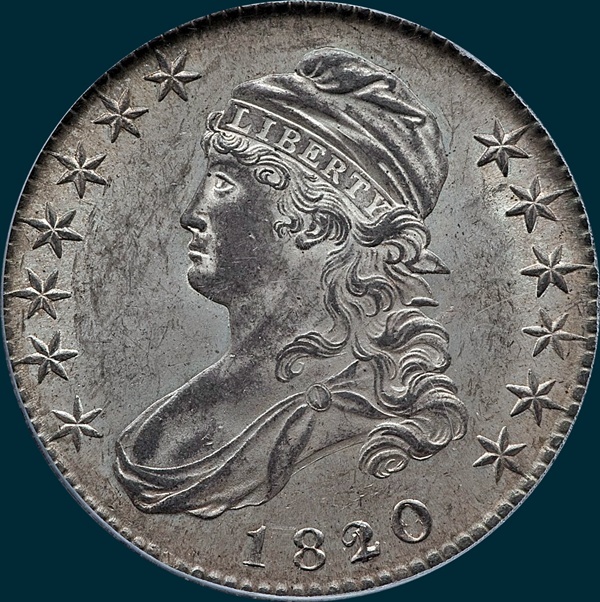 Variety Attribution O-101: Obverse-1820 over 19. Stars are large amd well formed. Date is 9 1/2 mm. with small square base 2 often called over 18, however, examination of accompanying photographs will show postively that it is over 19 and photo for O-101a will illustrate why it was easily mistaken for 18 as the thin lower loop of the 9 disappeared with use, leaving only the small projections at sides showing. However, the tail of the 9 is still visible in tiny projection at lower left in 0. O-101a: The thin line showing at bottom loop of 9 inside 0 is now disappearing leaving the side projections that are sometimes mistaken for an 8. O-101: Reverse- 50 C. is 2 mm. 5 has large round loop and short curved top. Arrowheads well separated. Arrow to A slightly over 1/2 mm. I is centered under T. Some, but not all specimens, show a die lump in angle of N. A fine die crack from edge across lower pair of olive leaves to claw is evident on some specimens. 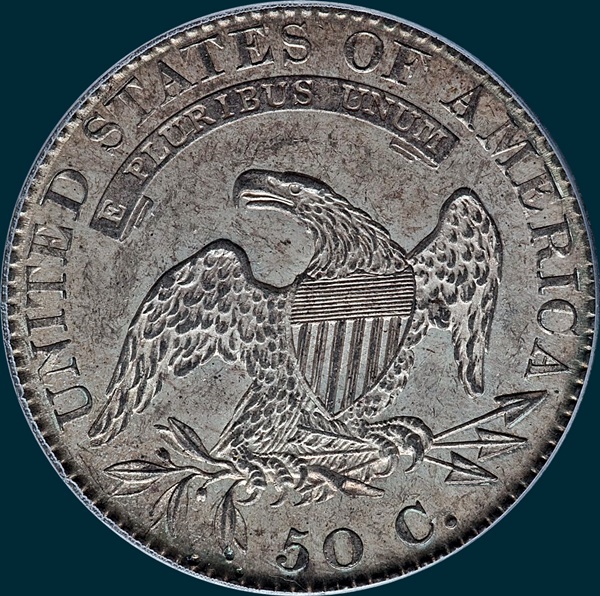 According to Edgar Souders, he estimates that the projected mintage for this overdate is approximately 187,780. Get his book Bust Half Fever and read all about overdates and how he came up with the number! This number would include two Overton varieties, O-101, and O-102.